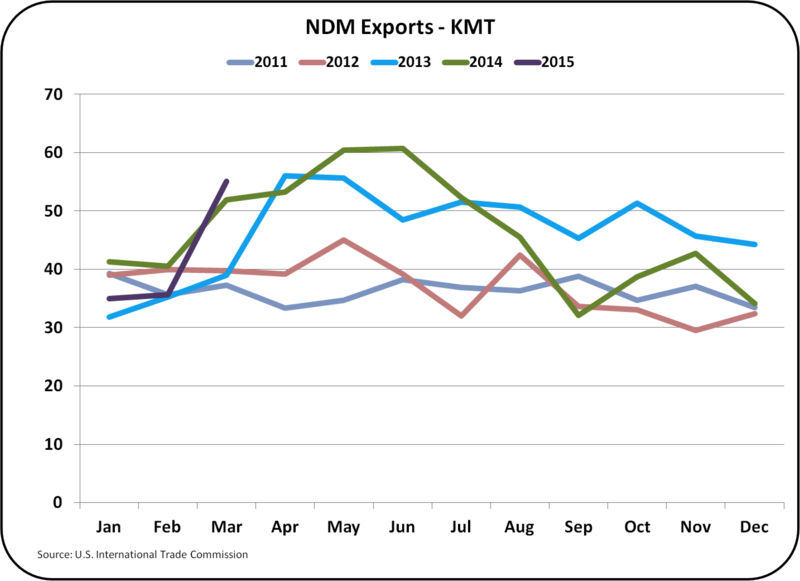 February exports showed nice increases as covered in the April 12, 2015 post to this blog. March exports were even stronger. 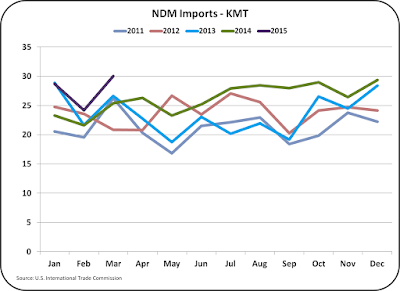 Interestingly, in March dairy imports were also up significantly for most of the dairy products tracked in this blog. However, imports of cheese, butter and nonfat dry milk were also up substantially. 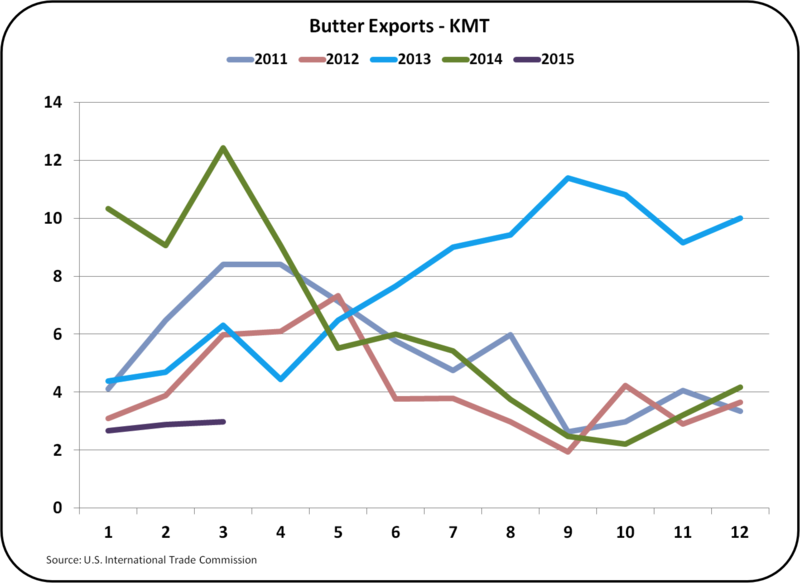 In the case of butter, the low exports and large imports made net butter exports negative. In-other-words, the U.S. is now a butter importer. In the commentary below, exports and then imports are examined in more detail. 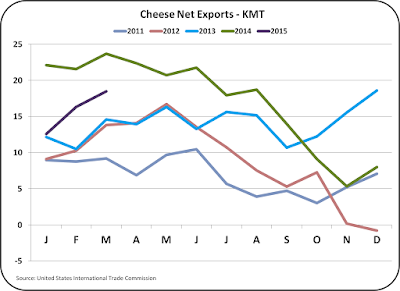 Cheese exports, which were very strong in March, are key to keeping cheese inventories in line, and thereby keeping cheese and Class III milk prices high. 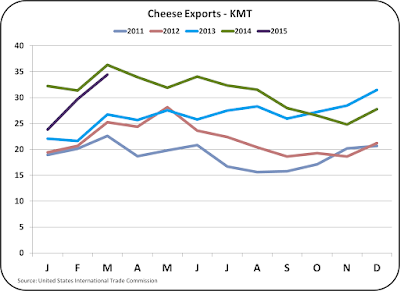 Exports of cheese to the U.S.'s second largest customer, South Korea, increased dramatically in March, bringing March cheese exports to the second highest level ever. Mexico remained that most significant market for U.S. cheese. 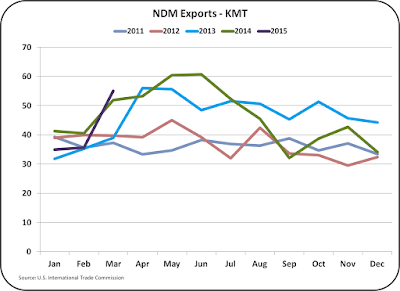 Nonfat dry milk exports were a record high for March. Prices have fallen in the international markets, but export volume appears to be holding and increasing. The increase in nonfat dry milk exports went mainly to Mexico. 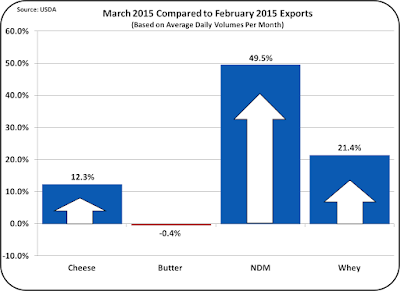 Butter exports were almost nil in January, February, and March of 2015. 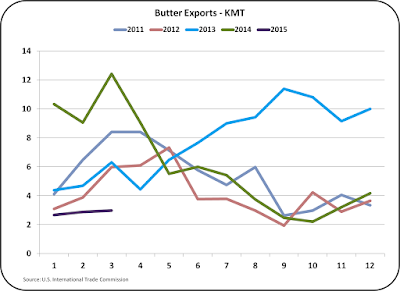 As mentioned in the May 3 post to this blog, butter inventories are so low, that there is essentially no available butter to export. This has kept the price of domestic butter and butterfat at reasonably high levels. 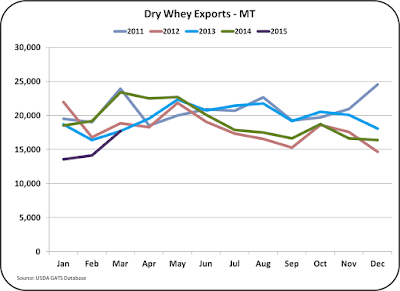 Dry whey exports continue to increase, but are still low compared to prior years. 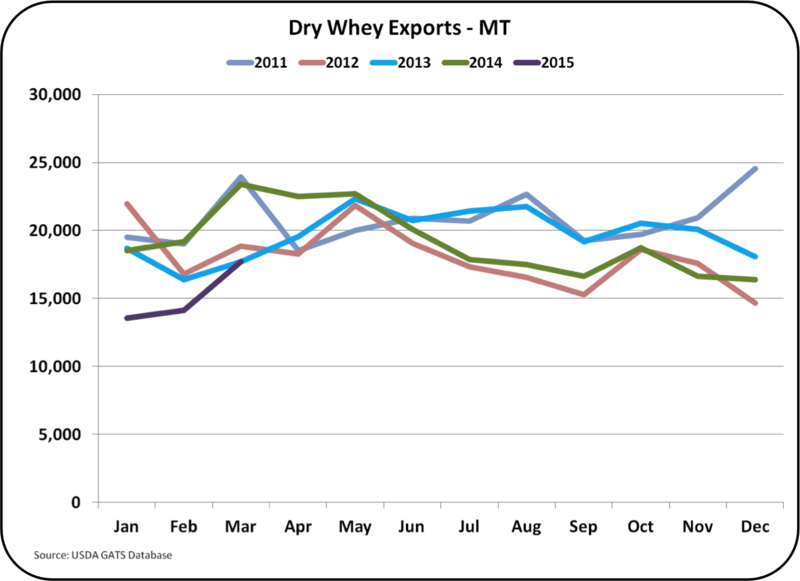 Dry whey is largely an export product and the fall in exports have hurt domestic prices. Dry whey is the basis for pricing "other solids" in the milk component payment system. In terms of overall U.S. dairy exports, Mexico holds a strong first place. The ties between the U.S. and Mexican dairy businesses are very strong. As an example, the first national U.S. dairy company was Borden, which was started about 150 years ago by Gail Borden. In 2009, the Borden milk business was acquired by Lala, the large Mexican dairy conglomerate. Mexico and the U.S. share a long border and Mexico, with a population in excess of one hundred million people, is a huge market. The North American free trade agreements have largely eliminated trade barriers for dairy products between the U.S. and Mexico. Mexican dairy operators and dairy consultants often attend U.S. schools and conferences and U.S. dairy consultants are frequently hired to assist Mexican dairymen in becoming more productive. Mexican consumers want dairy products and can increasingly afford them. Commercialization of the Mexican dairy industry is underway, but has a long way to go to meet the size and economic efficiency of U.S. dairies and processors. For these reasons, export growth of dairy products to Mexico will continue to grow and are less dependent on international affairs than exports to most other countries. When international circumstances allow exports to increase, typically, the same circumstances will cause imports to decrease. In March, this was not the case. 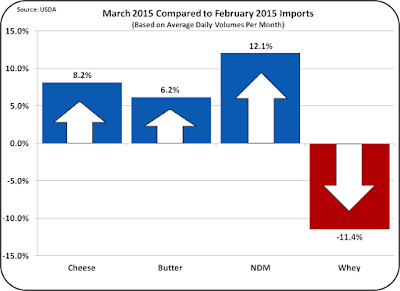 The charts below, show the trend of imports for cheese, nonfat dry milk, and butter. All are at record highs for the month. This may be just a transitional coincidence, and if so, it will play out quickly. Future posts to this blog will follow this unusual trend. 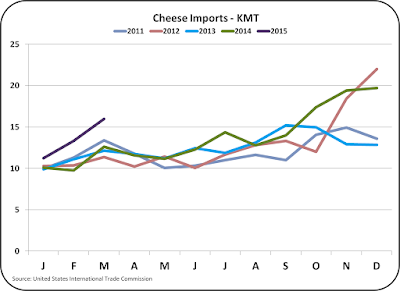 Cheese imports typically rise at year end, primarily composed of speciality cheeses for year end holidays. 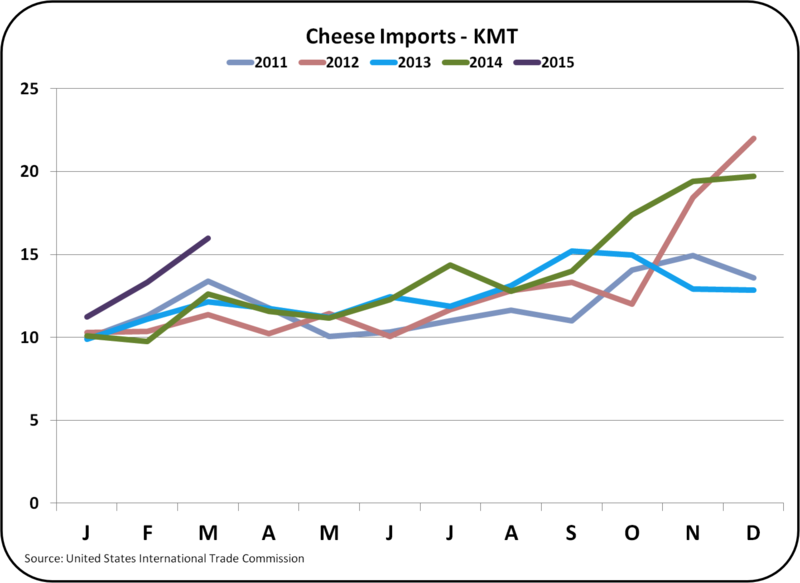 The record imports that have occurred so far in 2015 are unusual and have reduced the cheese trade balance achieved by the excellent increase in cheese exports. 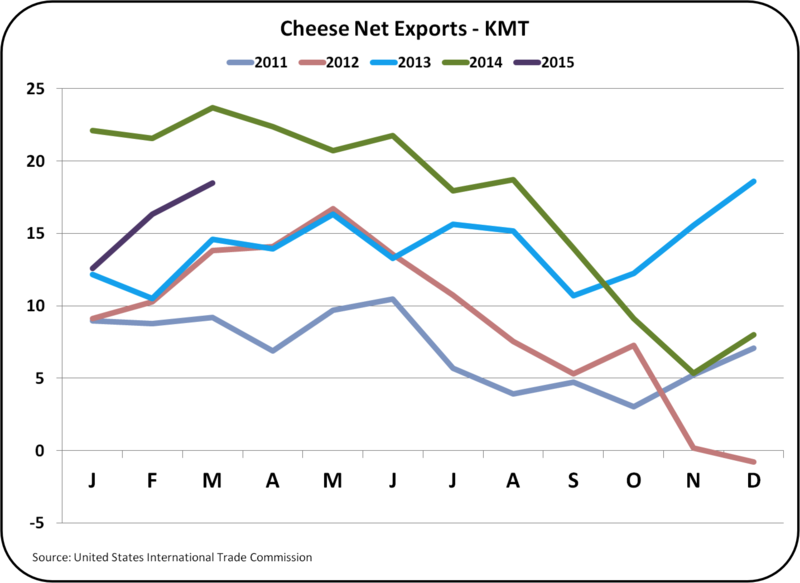 For the first three months of 2015, while cheese exports hit a monthly record (see chart above), net cheese exports (exports net of imports) have lagged significantly behind 2014. 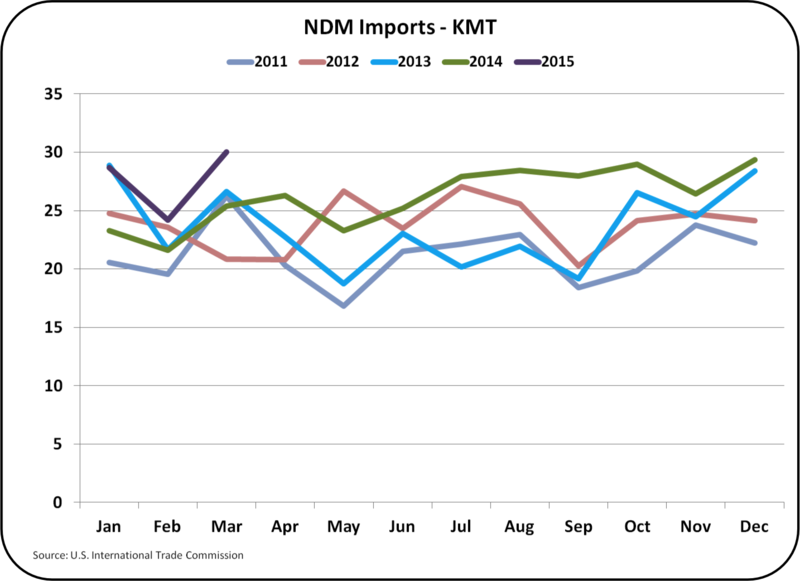 Nonfat dry milk imports grew to a record high in March. The increase in both exports and imports to record highs is not rational, and will continued to be followed in this blog. As reported in the May 3, 2015 post, butter inventories remain very tight. Imports of 4000 metric tons are very unusual. This imbalance has made the U.S. a net importer of butter. The availability of butterfat for butter churning has a lot to do with the availability of butterfat from nonfat dry milk production. 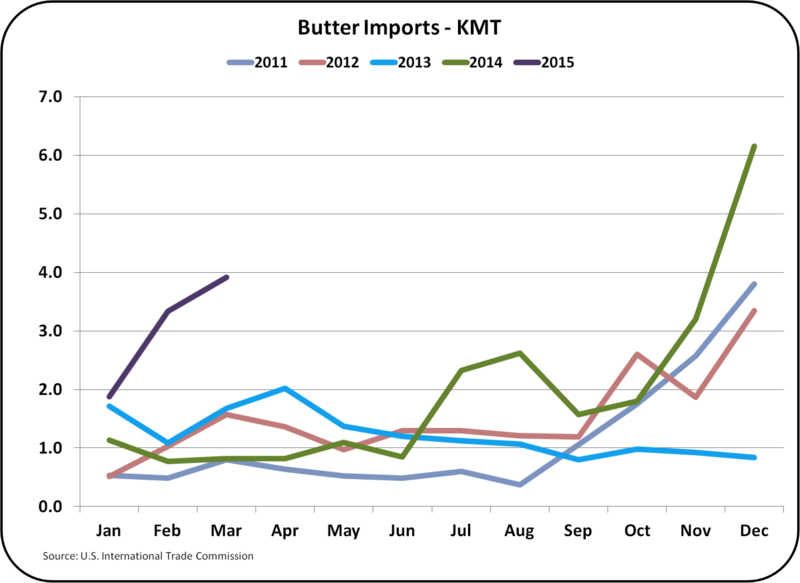 With increased nonfat dry milk exports, increased U.S. butter churning may reverse the need for imports. When February export numbers were released, the April 12 post to this blog was entitled "February Exports Encouraging." By comparison, this post could have been entitled "March Exports Very Encouraging." 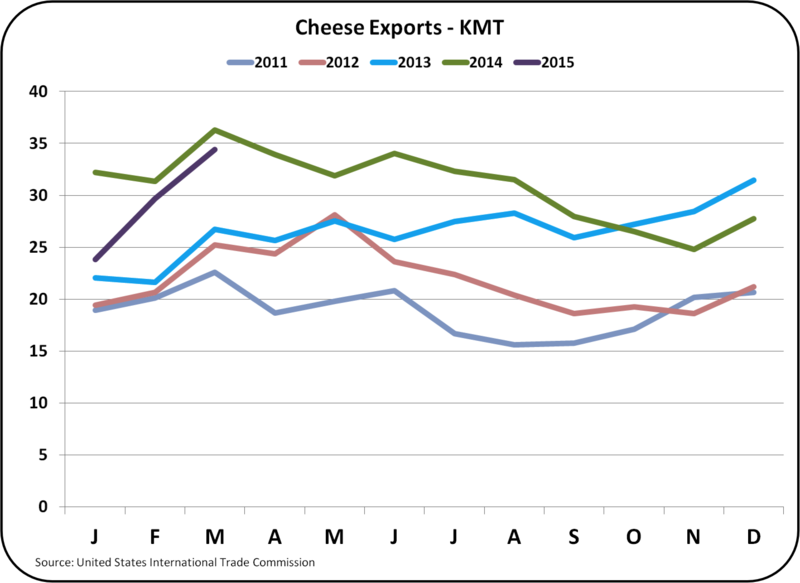 With the availability of March export data, futures prices of cheese and Class III milk have risen. The concerning new event is the rise in dairy imports. Imports will be followed and reviewed in more detail in an upcoming post. Hello, thanks for provide such as useful information about Exports Increase, this is great. In the pictures, really shows an exact ratio of Exports. Thanks for share it.